Jul. 15, 2014 2:00 a.m.
Beverley Oâ€™Connor and her fellow paddlers have formed a supergroup of sorts. 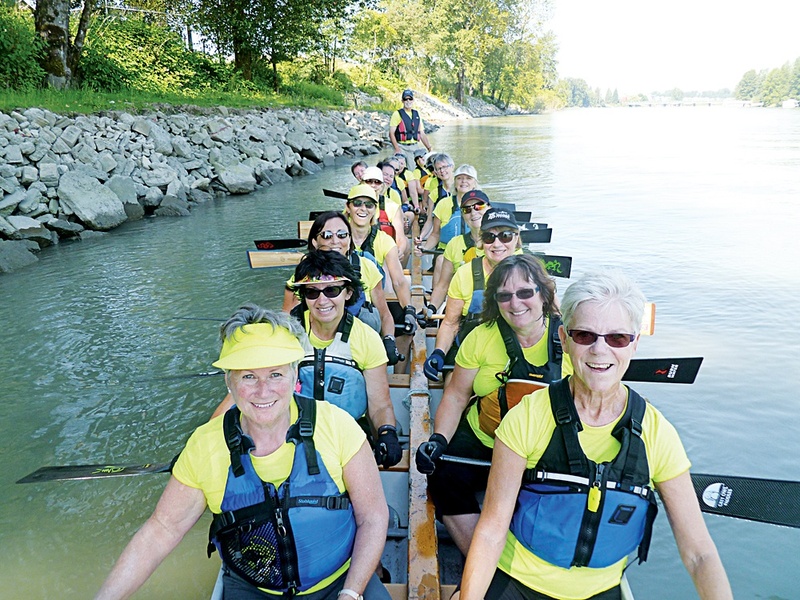 The dragon boating enthusiast wanted to compete in the BC Seniors Games this September, but didnâ€™t want to leave her own regular team to join one of the local groups already signed up. So she came together with a number of other over-55 paddlers to create the Flashdragons. The team members are all members of other local dragon boating crews, but now theyâ€™ll have a single banner under which to compete against foes both from Langley and the Lower Mainland and from around the province. Dragon boat racing is one of the more popular sports in the Seniors Games, with hundreds of athletes taking part. Teams have a drummer, a steersperson, and 20 paddlers. Unlike many athletic endeavours, dragon boat racing is dominated by women to such an extent that there is no menâ€™s division in the Seniors Games, noted Oâ€™Connor. There are womenâ€™s teams, like the Flashdragons, and mixed teams only. Sheâ€™s hopeful that the Flashdragons will have enough time to learn to work well together before they have to face off against their opponents. â€œOne of the most important things is timing,â€ said Oâ€™Connor. With their new coach, the team members will have to learn to put their paddles in and out of the water in perfect unison. They held their first full practise on the weekend, and will meet up for a total of eight more sessions before they head into the competition. Thatâ€™s not a lot of time for a traditional team, but because each member is already and avid paddler, they really just need to get to know one another and to mesh with their coachâ€™s style. â€œEveryoneâ€™s keen, theyâ€™re all fit because theyâ€™ve been working hard on their own teams,â€ said Oâ€™Connor. Sheâ€™s now sure how theyâ€™ll do. The last Seniors Games were in the Interior. â€œBeing in the Lower Mainland, there may be a little bit more competition,â€ said Oâ€™Connor. The Games are Sept. 9-13.